On Dec. 11, a plaintiff filed a civil lawsuit against the city of Escondido for an alleged violation of the Americans with Disabilities Act, as well as injuries and damages suffered as a result of lack of a handicapped accessible crosswalk and sidewalk at a heavily trafficked city intersection. Filed at the Superior Court of California in Vista, Winchester v. City of Escondido pits Fallbrook resident John Winchester, 46, against the city of Escondido. The complaint alleges that the injury took place at an intersection at the south 2000 block of Auto Parkway in Escondido, which contains numerous auto dealerships and is in close proximity to Interstate Highway 15. That rough terrain on city-owned property, the lawsuit alleges, led to Winchester falling and sustaining the following injuries: fractured pelvis, sternum, left knee, multiple ribs, his orbital, as well as a facial laceration on the right side of the face, a left thumb fracture and dislocation; and a right shoulder separation and tear. Prior to filing the lawsuit, as required by California state law, Winchester first filed a claim against the city of Escondido in April 2018. The city, however, never responded, elevating the claim to the civil litigation realm. 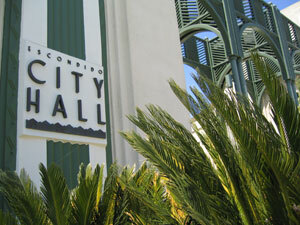 Winchester has asked the court for over $25,000 in damage fees to come from the city of Escondido’s coffers. Richard Prager, a lawyer for Winchester in the case who works for the San Diego-based firm Charles S. Roseman & Associates, said that he believes civil lawsuits of this sort can spark broader societal change and force cities to build out handicapped accessible infrastructure as a mainstay in development plans. Not everyone agrees with using the civil court system as a way to adjudicate ADA claims, however, and it has come under fire by the American Tort Reform Association, a corporate-funded organization. An American Tort Reform Association affiliate website, Sick of Lawsuits, has a whole section critiquing ADA cases of the Winchester variety. Prager says that in this particular case, he believes the facts point toward Winchester as a righteous victim who was badly injured. He says his firm has filed similar cases throughout North County, including in Oceanside. California, says Prager, has legal mechanisms on the books for ADA cases which allow for defendants in cases to settle cases with the aid of judges more hastily than other areas of the law. The goal, he said, is to keep legal costs low and have the law serve a broader public interest purpose. City of Escondido attorney Michael McGuinnes said that, as a policy matter, the city does not comment on ongoing litigation. Did this guy pick this location because it was obviously not up to ada standards or was he just cruising around in his wheelchair and had to use the location mentioned? If he did notice the problems before he ventured forward, why didn’t he just turn around and take another route . He shouldn’t have to turn around any more than you do! That’s why this law was established! Equal access! You try going through your life not being able to access sidewalks, open doors, etc., then you can pass judgement. I doubt it. I also use at time a wheelchair. Escondido is a mess. Take a look at the sidewalk along S. Escondido Blvd. Infront of Varso Gas and bar. The sidewalk is pushed up from a tree at least 45%. Wheelchair, heck it’s hard just to walk in that spot. This is common in Escondido. They rather work on appeasing the Hispanic community pandering for votes thhan helping the handicapped and disabled. Can I get into this lawsuit?